Iceland on Sunday lowered its aviation alert level from red – the highest – to orange, saying there was no imminent danger of the Bardarbunga volcano erupting. An orange alert cautions that a “heightened or escalating unrest with increased potential of eruption” still exists. For now, the no-fly restriction around the volcano has been lifted. Previously, the Icelandic Meteorological Office suggested, and aviation authorities enacted, a no-fly zone of 100 nautical miles by 140 nautical miles around the area. RELATED: Will Iceland's Volcano Ice North Atlantic Transit Again? However, the Office cautioned that seismic activities remain and that an eruption could not be counted out entirely. Airlines fear the same thing that happened four years ago could happen again. 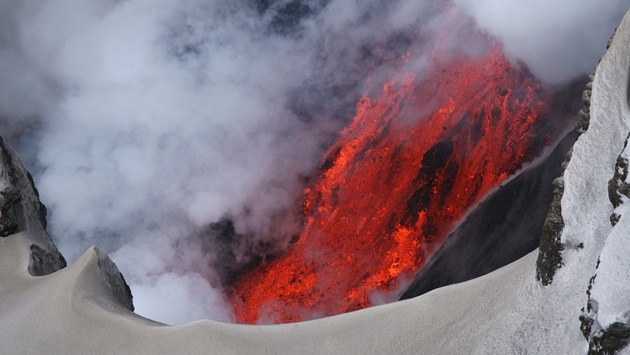 In 2010 Iceland's Eyjafjallajokul volcano erupted, emitting dangerous ash and smoke for thousands of miles. More than 100,000 flights were cancelled as European air space was closed for five days.